This was excellent. The first in a new series, featuring DI Ben Kitto, returning to the Scilly Isles where he grew up. 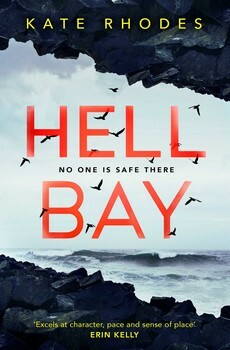 Thanks to his local knowledge, he is roped into a murder investigation when the daughter of one of his old schoolfriends is found dead, having fallen over the cliffs at Hell Bay. On a small island, with no one allowed on or off other than the police, the tension mounts. Ben himself, with the dog he inherited from his former colleague, is increasingly under threat, and is warned off, while his superior presses for quick results so that the island can return to what passes for normal. The inhabitants of Bryher are sympathetically portrayed, with commentary on the mores of island life, the ways in which people adapt to a confined environment. The pace never lets up, and there are several clever twists before the end. One or two seemingly significant plot strands were either resolved a little too quickly or left hanging at the end, but as the first in a series, there may be an intention to revisit at least one of the themes, on the abuse of power. Rhodes sets up Kitto’s history skilfully, showing how the life of a policeman has taken him a long way from his roots. For page-turnability, this is one of the best I’ve read this year. This entry was posted in Uncategorized on October 14, 2018 by CountryCrime. George Mann’s Wychwood is billed as a cross between horror and crime fiction, with supernatural elements, which might lead one to believe that this would be closer to a work by Phil Rickman, or perhaps James Oswald. In fact, this is almost cosy in comparison, which could be due to its setting in the Cotswolds, which exert their own rose-filled influence over everything, in the same way that PG Wodehouse’s Honeysuckle Cottage turned a writer of lean muscular prose into something more winsome. The newly divorced reporter Elspeth Reeves has returned to her childhood home, only to find that a murder has been committed in the woods behind her house, part of the eponymous Wychwood. She teams up with local policeman Peter Shaw, and together they discover the murders (plural, and rapidly increasing) are linked to the local legend of the Carrion King. I have one or two quibbles with the likelihood that any policeman would be allowed to take a friend with him to interview suspects, but fiction generally depends on the suspension of disbelief, so if you disregard the finer points of a police procedural, this keeps up the pace, and comes to a satisfying conclusion at the end. The supernatural element is vanishingly slight, the horror muted, and the overall effect is very Home Counties. A readable traditional cozy, no matter what the marketing would have you believe. This entry was posted in Cotswolds, Crime fiction on February 28, 2018 by CountryCrime. A bleak novel, this week – Brian McGilloway’s Borderlands, set on the borders between Northern Ireland and the Republic, the “soft” border that may be about to become a “hard”, or controlled, border again as Brexit looms. The past, including the pre-cooperation days of the controlled borders, casts a long shadow over this area, and Inspector Benedict Devlin of the Garda travels backwards and forwards over the border as he attempts to track the killer of a young girl, found almost naked in woodland, just before Christmas. She had been seen with a young traveller boy, and suspicion falls on him and his family. At the same time, Devlin is asked to investigate a break-in at an old people’s home, witnessed by the father-in-law of his ex-girlfriend. The plot is as intricately enmeshed as the branches on a winter tree, and confidently handled, but this is a harsh world full of violence, with little in the way of likeable characters or any leaven of humour. McGilloway was shortlisted for a Debut Dagger for this, and deservedly so. And yet – pulls out soapbox and stands on it – I wouldn’t trust a detective that couldn’t be trusted with a dog, and Devlin is simply Too Irresponsible for Dog Ownership (TIDO). He leaves a basset hound (short-coated dog) in a shed each night, in the snow, at Christmas, and when the dog escapes and is accused of sheep-worrying, does he defend the dog, or take him into the house? Does he heck. I began by assuming this was the author’s way of telling us that Devlin was a villain (Hollywood code these days for a bad guy involves violence towards dogs) but no, it turns he was simply TIDO. Violence, swearing, goes with the genre – total irresponsibility doesn’t, and annoys me no end. Other dog people may feel the same. This entry was posted in Crime fiction, Ireland, Uncategorized on February 20, 2018 by CountryCrime. Julia Chapman’s Date with Death is the first in a series set in the Yorkshire Dales, in the fictional village/small town of Bruncliffe. Delia Metcalfe, recently divorced, is struggling to make ends meet with her dating business, and has rented out part of her building to an unknown stranger – who turns out to be the black sheep of the village, Samson O’Brien, who has returned to the Dales after a career in the police. No one is glad to see him return, except perhaps his feckless ex-alcoholic father, now in an old people’s home. When one of Delia’s friends is found dead, the grieving widow asks Samson to investigate. However, more men in the area are winding up dead, and the one thing they had in common was attendance at one of Delia’s speed-dating events. Delia and Samson are forced to join up in order to catch the killer, despite their differences. This is obviously intended to be the first in a series, with hints thrown out about Samson’s previous career that are never resolved (pet hate of mine). I also struggled to differentiate between some of the characters. That aside, Chapman has an engaging style of writing, and although the Cathy/Heathcliff sparring between the fell-running Delia and the darkly brooding Samson may pall without strong plotlines, this was a creditable first outing. This entry was posted in Crime fiction, Yorkshire on February 6, 2018 by CountryCrime. A read from the 1980s this week – Peter Dickinson’s The Last Houseparty. I was a big fan of his works for children, in particular the Changes trilogy, set in an England that had gone backwards, when the machines were smashed and the population took up the lives of medieval peasants, with only a handful of children somehow immune, and able to remember a time when there were machines. I found echoes of this in The Last Houseparty, which flits between eras, from 1937, when the eponymous houseparty took place, an encounter in the North African desert in 1941, up to the early 1980s (the mention of Laker Airways dates this). In the present day, the young daughter of Lady Snailwood’s secretary is an adult, showing visitors round the house, which is falling apart, the famous mechanical clock and its rotating figures now still. In the past, the two Quintain cousins have been invited by their aunt Zena to entertain at her political salon. Zena was meddling in affairs of state, and seems to be trying to settle the Middle East, but the talk is largely of how to prevent the coming war. During the weekend, a number of terrible things happen, initially only mentioned obliquely in the present day, so that the reader has to act as detective, slowly revealing more and more of the picture, but the truth is only made clear in the final paragraph. This left a rather bitter taste, and I wanted to like this more. It is perhaps more of a literary novel than crime fiction, despite the crime. The author has obviously carried out extensive research into clock workings, cars of the 1930s, and croquet, amongst other things, but somehow the characters never quite spring to life. One for the “interesting but tastes have changed” pile. This entry was posted in Country House on January 30, 2018 by CountryCrime.